Midwinter in the cross timbers of western Lincoln County. Native blackjack and little bluestem. Age pyramid for Lincoln County, Oklahoma, based on census 2000 data. As of the census  of 2000, 32,080 people, 12,178 households, and 9,121 families resided in the county. The population density was 34 people per square mile (13/km²). There were 13,712 housing units at an average density of 14 per square mile (6/km²). The county's racial makeup was 86.43% White, 2.46% Black or African American, 6.57% Native American, 0.25% Asian, 0.02% Pacific Islander, 0.45% from other races, and 3.82% from two or more races. 1.51% of the population were Hispanic or Latino of any race. There were 12,178 households out of which 34.10% had children under the age of 18 living with them, 61.50% were married couples living together, 9.20% had a female householder with no husband present, and 25.10% were non-families. 22.40% of all households were made up of individuals and 10.50% had someone living alone who was 65 years of age or older. The average household size was 2.59 and the average family size was 3.03. In the county, the population was spread out with 27.40% under the age of 18, 7.80% from 18 to 24, 26.70% from 25 to 44, 24.10% from 45 to 64, and 13.90% who were 65 years of age or older. The median age was 38 years. For every 100 females, there were 97.30 males. For every 100 females age 18 and over, there were 94.50 males. The county's median household income was $31,187, and the median family income was $36,310. Males had a median income of $28,647 versus $20,099 for females. The county's per capita income was $14,890. About 11.10% of families and 14.50% of the population were below the poverty line, including 17.90% of those under age 18 and 12.10% of those age 65 or over. 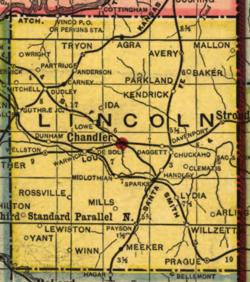 1905 map of Lincoln County showing locations of many of the old communities, post offices, and railroad stops which no longer exist. Jim Thorpe (1888 - 1953), American athlete, attended Sac and Fox agency school in Lincoln County. Roy J. Turner (1894 - 1973), Oklahoma governor 1947-1953, born in Kendrick. ^ a b c d e f g h Mullins, William H. "Lincoln County - Encyclopedia of Oklahoma History and Culture". Oklahoma Historical Society. Retrieved 21 May 2011. ^ a b "State & County QuickFacts". United States Census Bureau. Archived from the original on July 14, 2011. Retrieved November 9, 2013. ^ "County Profiles". www.greateroklahomacity.com. Retrieved 2018-03-29. ^ "Centers of Population by State: 2010". United State Census Bureau. Retrieved February 21, 2015. ^ "2010 Census Gazetteer Files". United States Census Bureau. August 22, 2012. Retrieved February 21, 2015. ^ "U.S. Decennial Census". United States Census Bureau. Retrieved February 21, 2015. ^ "Historical Census Browser". University of Virginia Library. Retrieved February 21, 2015. ^ Forstall, Richard L., ed. (March 27, 1995). "Population of Counties by Decennial Census: 1900 to 1990". United States Census Bureau. Retrieved February 21, 2015. ^ "Census 2000 PHC-T-4. Ranking Tables for Counties: 1990 and 2000" (PDF). United States Census Bureau. April 2, 2001. Retrieved February 21, 2015.